May 3, 2017 - Stanford lecture by my long-time collaborator Andrew Schloss, with lots of the pieces we did together - "A history of radiodrum and robotics in musical performance". Works discussedinclude "Underground Economy," "The Seven Wonders of the Ancient World," "Maravillas," "MaraDeviBot Variations," "The Space Between US," and others. I will be presenting a concert and lecture at Mills College on November 23, as part of their Songlines series. Entitled "Bits, Birds and Bluegrass," it will include my first public performance of "Cluck Old Hen Variations" (though not the first time the work has been performed). I will also be performing "Impossible Animals," for Zeta violin and computer voices. The lecture will include excerpts from such works as "Would You Just As Soon Sing As Make That Noise! ?," "Who's on First?" and "The Space Between Us." More info at Mills Now. Here is a short excerpt of my performance of "Cluck..." from an informal concert at Universal Audio corporate headquarters in Scotts Valley, California. The complete recording of the lecture is now on-line here. I discussed the making of Silicon Valley Breakdown, as well as my creative process, my studies with Henry Brant, the early days of computer music at Stanford's Artificial Intelligence Laboratory, and more. The November 6, 2013 event also included performance of the newly-restored quadraphonic version of Silicon Valley Breakdown. I will be up in Victoria the week of November 3-10 for a Jaffe Festival, which will include three concerts of my music, including a world premiere, and including compositions that span more than three decades. As the Orion Fellow of the University of Victoria, I will be presenting a lecture (November 6) and concert of "Silicon Valley Breakdown," presented in its rarely-heard quadraphonic format, with a newly-restored copy of the tape. I will also be addressing the Composition Seminar and teaching a class. Following this (November 8) will be a concert at Open Space, including the world premiere of "Fox Hollow" for string quartet, commissioned by the Lafayette String Quartet, as well as the Canadian premiere of "The Space Between Us," for radiodrum, Trimpin instruments, and eight strings, the Canadian premiere of "Impossible Animals," version for trombone and tape, and other pieces. The concert is rounded out by "Cluck Old Hen Variations," for solo violin. Finally, on November 9th is a concert at the University of Victoria focusing on my music for guitars and plucked strings. Program details on the Victoria Guitar Society web site. Most of the pieces on this concert are Canadian premieres. 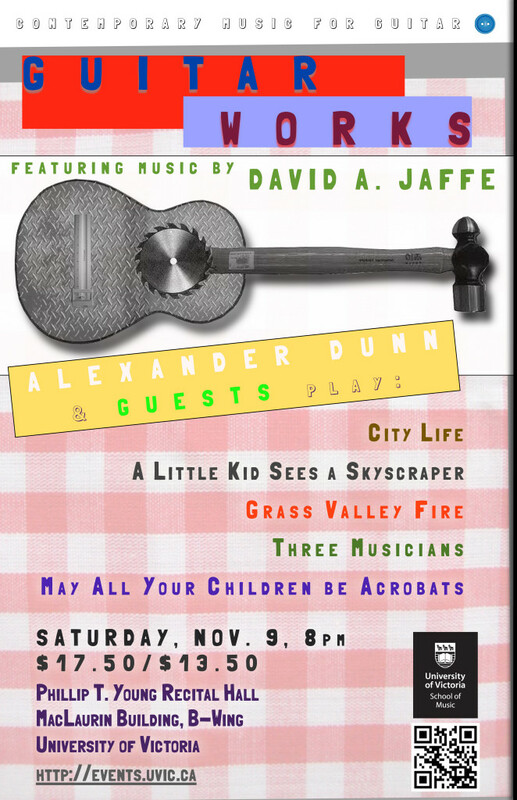 I'll be playing the 5-string banjo on "City Life" and mandolin on "Grass Valley Fire, 1988." In addition, the concert will include "May All Your Children Be Acrobats," for eight guitars, voice and computer-generated sound, "Three Musicians, after the Picasso paintings," for viola and guitar, and "A Little Kid Sees a Skyscraper," for two quarter-tone-tuned guitars. All in all, eleven works will be presented.